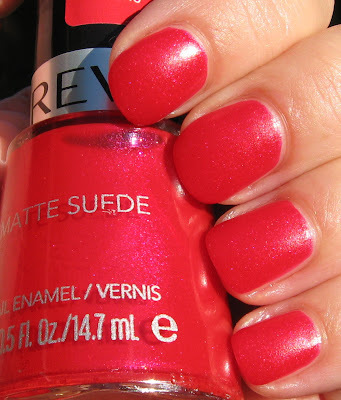 Now these are some nice additions, Revlon! 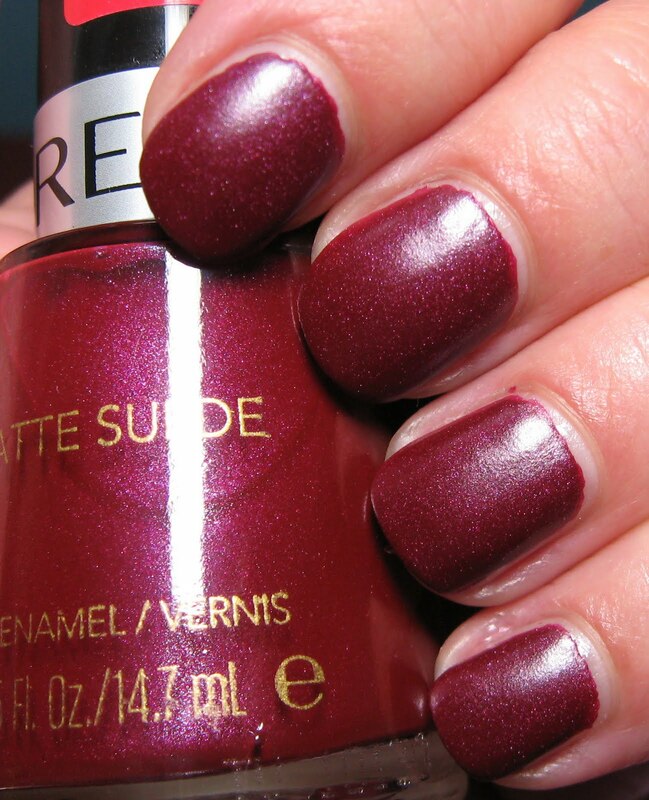 The new, and I think non LE polishes from Revlon are called Matte Suede and come in 4 shades. I'm seeing them mixed in with the permanent collection in stores, as well as in table top displays. The stickers on the caps don't say Limited Edition, so hopefully they'll be around for a while. The finish on these is more of a satin matte and what's interesting about them is that the glitter doesn't seem to have the same finish, because it's brighter and well, glittery! These are not as flat of a finish as the OPI Suedes, for reference. Above & Below: Fire Fox is a bright red with the slightest hint of pink to it. It's shown above in a natural state, and below with a clear top coat. The glitter is a pink/red tone. 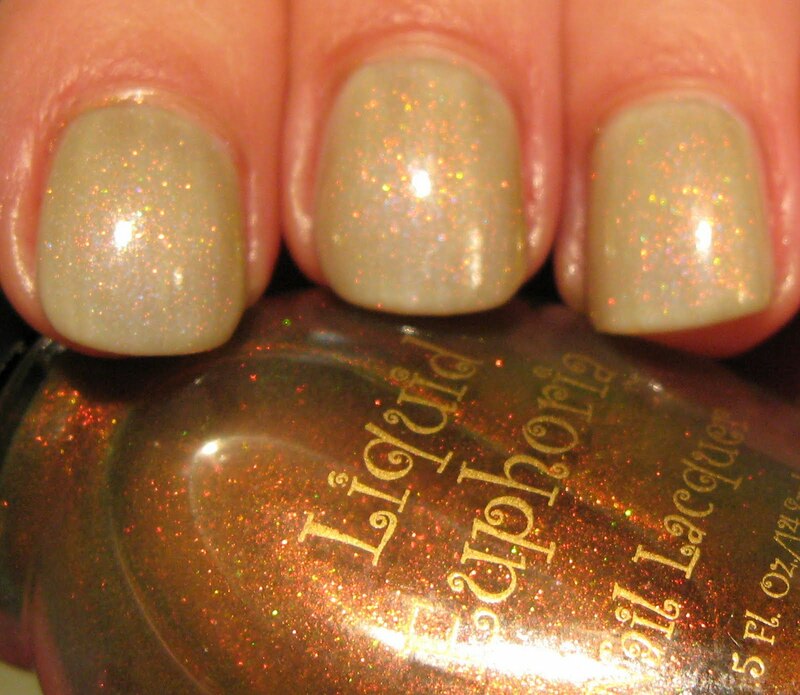 Below: Emerald City is shown both alone and with a top coat. This shade has a lot of charcoal in it and the glitter is a lighter shade of emerald that flashes to a pale aqua in brighter lighting. Below: Powder Puff is a white that's toned down with a very slight pale blue iridescent overlay. Not enough to make it look blue, but enough to take some of the starkness of the white away, leaving a delicate white that works very well by itself. I shy away from white unless I'm using it as a base or stamping color, but this is something I'd definitely wear alone. The glitter in this one is both white and pale aqua. Below: Powder Puff also makes a nice streak-free base for layering, shown here with Liquid Euphoria Nirvana. 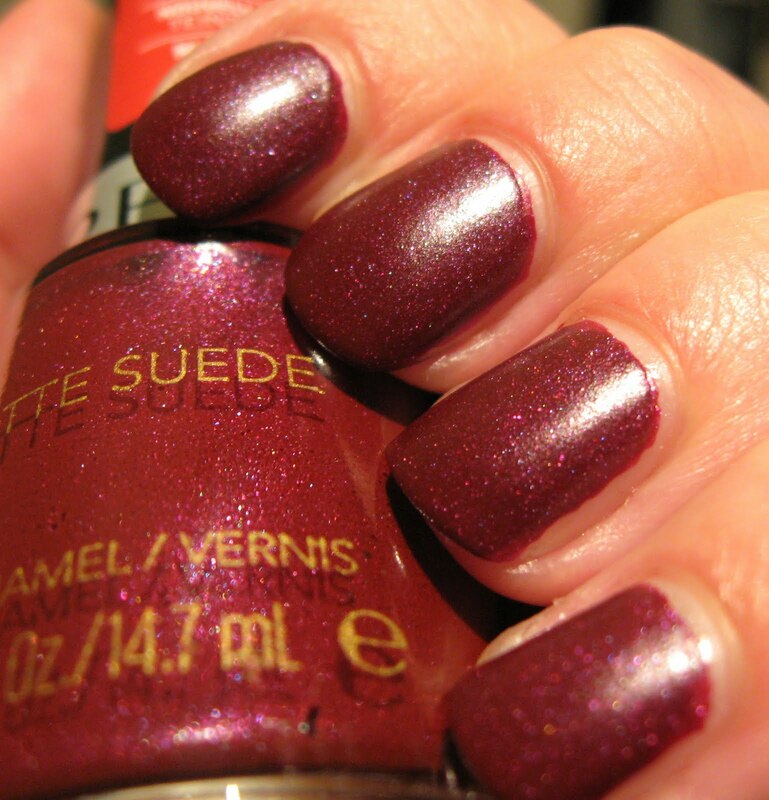 Below: Ruby Ribbon, a wine shade with light purple glitter covered very nicely in 2 coats. I used 2 coats on all of these with the exception of Powder Puff, which was 3 coats. I am loving these polishes! The application was easy as can be, and the pigmentation is high in all of them. I had some uneven areas with Powder Puff due to the fact that it's a lighter shade perhaps, so that was the lone 3-coater. The finish is not terribly flat, and the glitter still stands out nicely on these. Of course adding a clear top coat enhances the glitter all the more. These would likely work well as stamping polishes and with the more matte finish, stamping them over a gloss finish would give a somewhat texture-toned look. I'm hoping these are permanent additions to Revlon's core display, because I would love to have some more shades from this line. Already thinking ahead, I can imagine a dark taupe, a purple, a deep teal, and maybe even a lighter gold shade. What other colors would you like to see in the Matte Suede line? powder puff is so beautiful! I must have them all. I simply must. 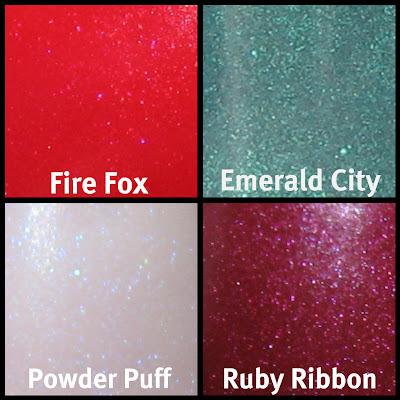 I love Fire Fox for the name alone :P Powder Puff is neat. I love the look of the pink and white one. Doesnt the white look like a great not too eyecatching wedding appropriate polish!?? 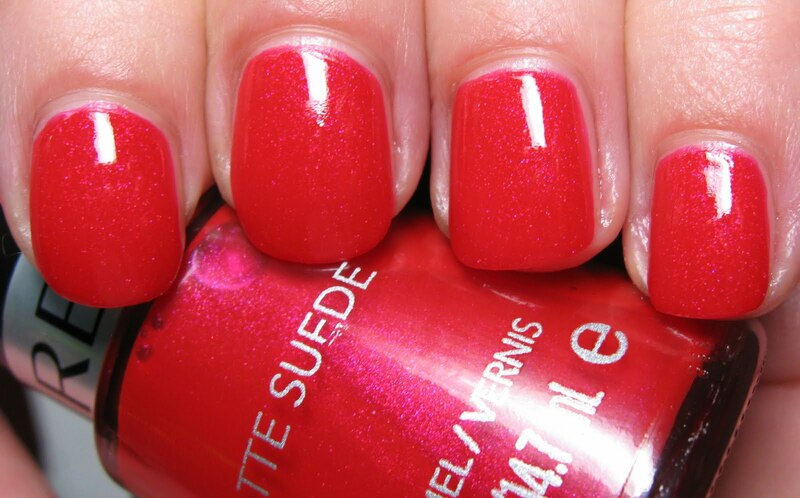 Oh, those are absolutely gorgeous, and I love the way when you add a topcoat they seem to have so much depth! These are seriously beautiful! I'm glad to see these from Revlon, it's a line I've normally ignored in the stores. Now I'm wondering why I did that! I just saw this display yesterday but didn't have time to really check them out. I'll have to go take a closer look this week. Thanks for the swatches! I haven't seen these yet, but I'll be looking for them especially Powder Puff and Emerald City. Amazing swatches! I haven't seen these yet! Had my girlfriend look for these over the weekend and she didn't see any. I'm looking forward to all of them. Especially Emerald City and Ruby Ribbon. I hope they do keep these in their regular lineup. I saw Ruby Ribbon at www.lacquerized.com a couple weeks ago and couldn't stop thinking about it. Love Powder Puff too! I hope I can find them at Walgreens or CVS; we don't Meijer in OK. I've decided I have to have Emerald City,even though it leans towards aqua,I find it extremely appealing. I'm in love with Powder Puff! These are discontinued. I bought Emerald City and I love it with a top coat. It reminds me of a color of a car I used to drive, which are good memories for me!